The marketing software company HubSpot has risen to veritable kingship in just over 10 years of existence. Beyond making good marketing software, many consider the company a leading resource for content marketing strategy. 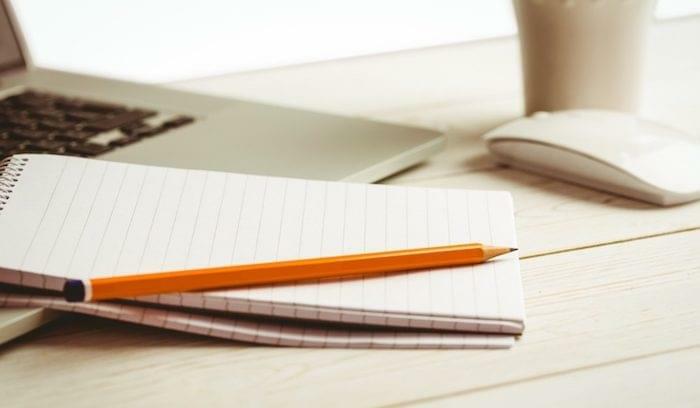 If you aren’t one of the 15,000 companies that use HubSpot’s marketing, sales, and CRM platform, you’re probably one of the hundreds of thousands of people who regularly read their blog. According to a 2015 analysis by Mintingo, HubSpot beats all other marketing automation (MA) vendors, hands-down, for market share by customers. In other words, HubSpot is really stinking popular. Some of the enterprise vendors like Eloqua, Pardot, and Marketo take in more revenue, but that’s because they have bigger clients, bigger deployments, and higher price tags. Even so, in their last fiscal year, HubSpot took in over $271 million in revenue, up 49 percent over 2015. HubSpot’s product is billed as an “inbound marketing and sales platform,” so it’s not surprising that they’re one of the loudest proponents of inbound strategy — at times, even suggesting that inbound should/will dethrone outbound. In keeping with this focus, their product is designed to help companies attract interest, capture leads, and nurture those leads into business opportunities. One of HubSpot’s biggest selling points is that it’s an all-in-one solution — meaning you get all the features you need for one price, in a tightly integrated cloud suite (sales applications are available as free add-ons). HubSpot is a great product. It wouldn’t own half the customers in the marketing world if it weren’t. But that doesn’t mean your search stops there. Even though HubSpot is less expensive than most of its big box competitors, it still may be a tad over budget for small businesses. It might lack features your team needs, or, conversely, it might have too many features and be difficult to manage. It’s all a matter of perspective. 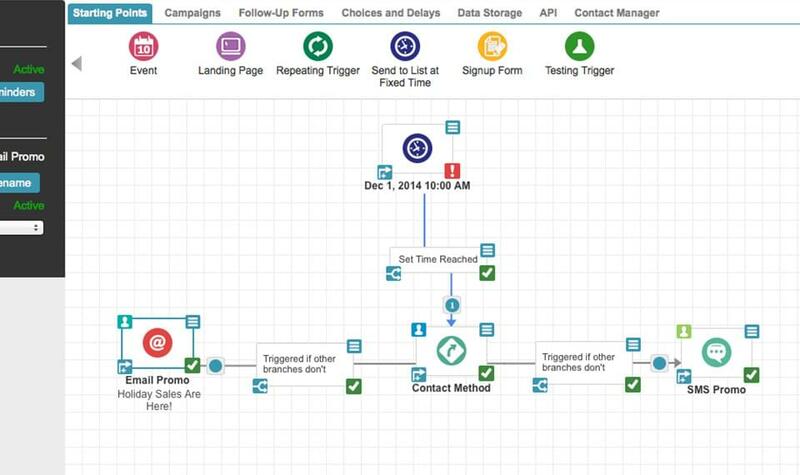 LeadSquared offers a marketing automation platform with a sales CRM. They’ve recently turned into a leader in the marketing automation space because of their customer-needs-focused vision. The company started in 2012 after actually working with B2B and B2C marketers, and they found what these folks actually needed before building the tool, rather than building the tool and hoping that it would fit the needs of the marketers. LeadSquared offers not only lead capture across a website and brand presence but also includes lead nurturing and engagement and analytics to round out the suite of tools. They recently added the Conversion platform accessed by quote only. This new tool uses artificial intelligence to learn your customer behaviors and begin the predictive selling process. 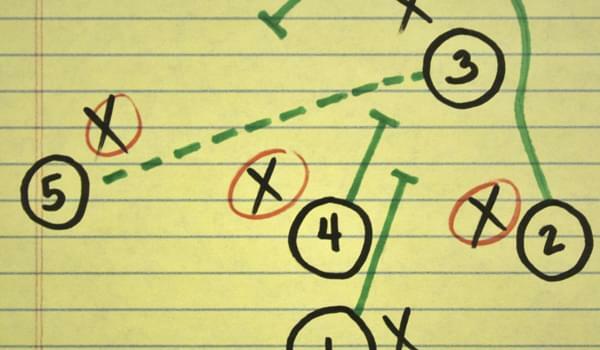 Think of it as lead scoring that learns from past customer behavior. 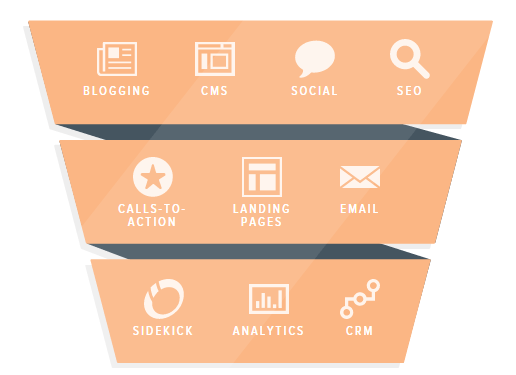 UserEngage offers a full suite of tools to drive conversions through web and sales traffic. These tools target eCommerce and SaaS companies that look to drive traffic to and down their conversion funnels. The UserEngage CRM uses user analytics directly in the user profiles to drive sales growth through personalized data and up to the minute information. The app drives direct customer engagement with Live Chat features to meet customers where they interact with your website, and powerful visual workflows help your team move customers down the pipeline. Act-On is a cloud based marketing automation platform designed specifically for small to medium size businesses. It’s in the same league as HubSpot in terms of providing an affordable, less complicated alternative to vendors like Marketo and Eloqua. Unlike HubSpot, Act-On does not provide a built-in CRM database, but it does offer native integration with some of the industry’s leading platforms, including Salesforce, SugarCRM, Microsoft Dynamics, Infor, and Netsuite. 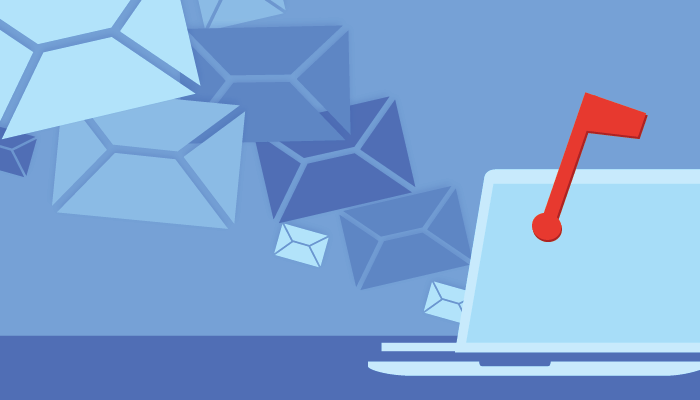 As any good marketer will tell you, a marketing automation platform isn’t much good unless it’s connected to a CRM — so these integrations are important selling points. Act-on offers pretty much all the functionality you’d expect in a marketing platform — from lead management to email, social, SEO, and advanced reporting. Their product comes in two price tiers, which are comparable to HubSpot. 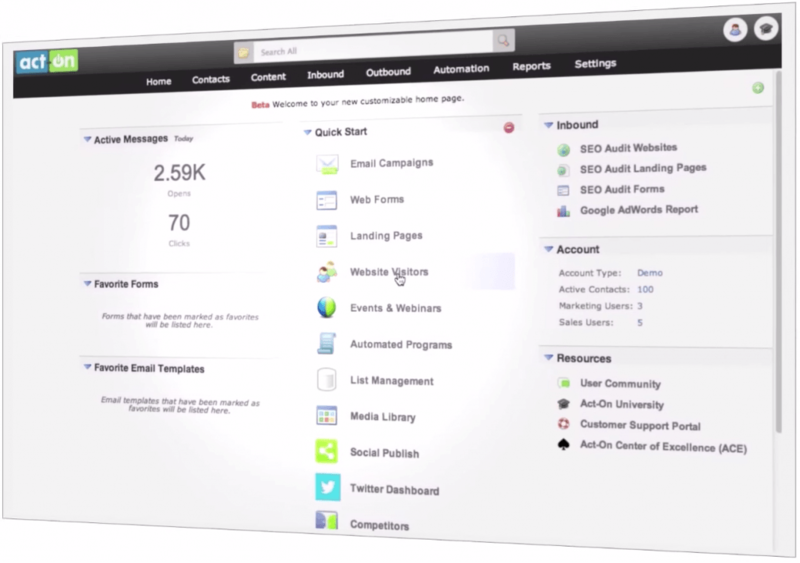 Salesfusion is a B2B marketing platform targeted at mid-market companies. Salesfusion’s features are built on a “CRM-style, contact-centric relational database,” which gives it a strong advantage in terms of sales/marketing continuity (hence the name “Salesfusion”). You’ll still need a third party solution for CRM, but you should see a much tighter alignment of workflows between systems, including campaigns, custom objects, and lead intelligence (not just data exchange). Salesfusion integrates with Microsoft Dynamics, Sage, Salesforce, Infor, and SugarCRM. 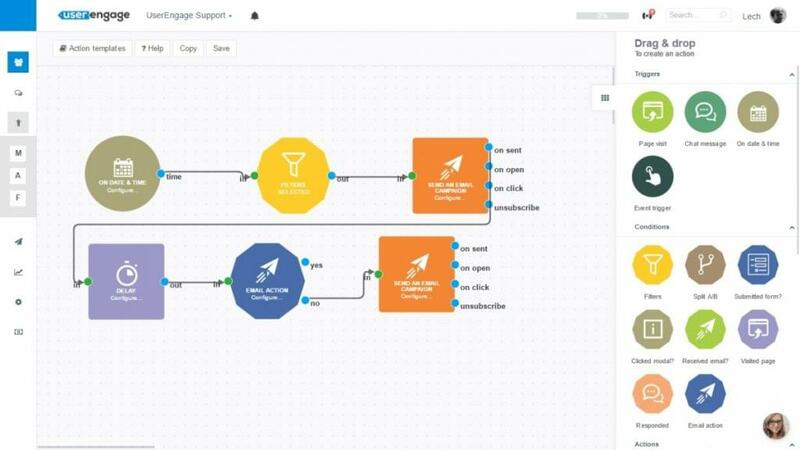 Some users say that Salesfusion’s analytics tools are a little basic for a modern platform — i.e., you could see most of the same information using Google Analytics. 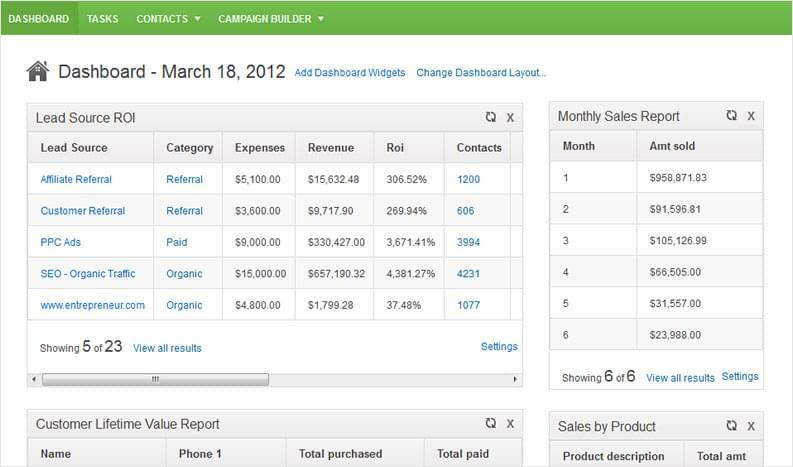 However, it does offer a custom report builder for deeper insights. On the surface, Infusionsoft offers one of the most comparable solutions to HubSpot’s platform. Theirs is a “complete sales and marketing” solution including email marketing, lead management, and CRM. Unlike HubSpot, however, Infusionsoft is first a CRM, second a marketing platform, which means their contact management and sales features are a little more robust, and their marketing tools a little less. Another wild card: they provide a built-in e-commerce module, so businesses can set up digital storefronts, manage inventory fulfillment, and billing — a perfect opportunity for the demand-minded B2C brand. 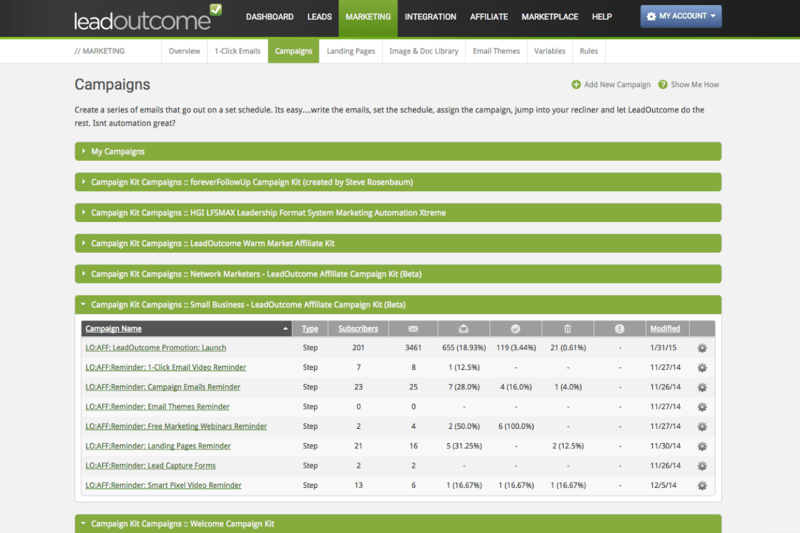 Again, since it’s a hybrid product, Infusionsoft’s MA features are less advanced than other leading solutions. 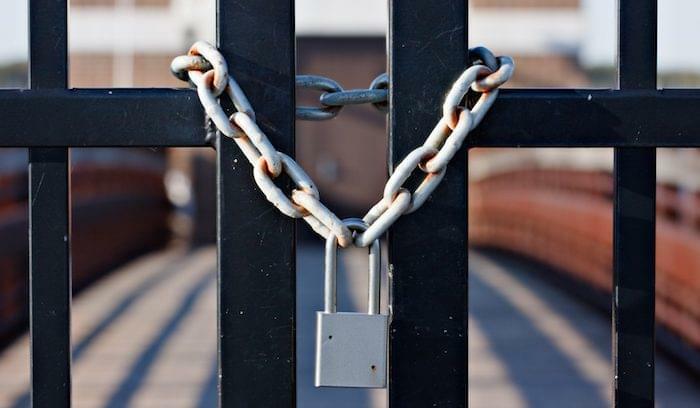 They don’t offer much in the way of social analytics, lead nurturing, or SEO (although they do have an app marketplace full of compatible partner solutions). Infusionsoft’s pricing and features are designed to accommodate small businesses; licenses are sold in user groups from 3 to 10, but the cost is generally about half that of HubSpot. SimplyCast is all about leads — finding them, organizing them, nurturing them, and tracking them through the funnel toward conversion. Their marketing platform spans across email, social, voice, SMS, live chat, and events to offer a truly multi-channel solution. 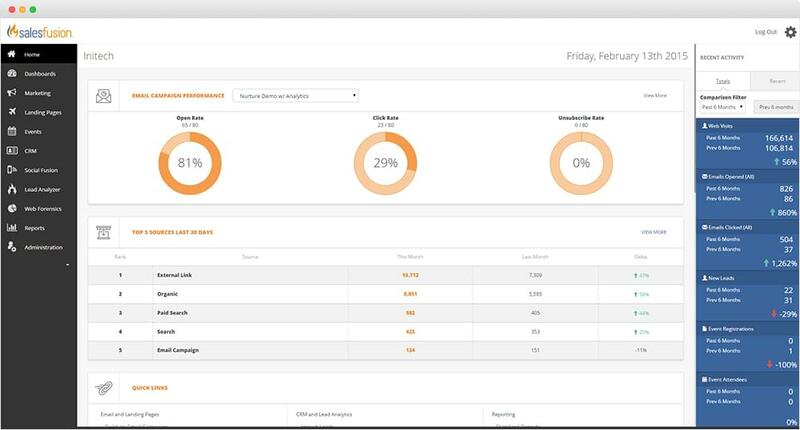 SimplyCast also offers free, built-in CRM and sales dashboards, joining the ranks of MA vendors making this move. Instead of operating within the typical confines of email, social, and web marketing, SimplyCast expands to a number of channels and mediums that most vendors don’t address. You might consider these channels avant garde, even useless (fax marketing? ), but if not, you have options. SimplyCast’s pricing is comparable to Infusionsoft. LeadOutcome is a newer player in the marketing automation space, so they’re still building a customer base and improving their product. Even so, they offer a wide range of features for marketing teams, ranging from lead management to email marketing, landing pages, web forms, and basic analytics. The system works through a series of turnkey, “done-for-you” campaign kits, so it’s a good choice for a one-person team, or anyone who’s new to inbound marketing. Their solution is the least expensive HubSpot alternative, which is great for a tight budget, but does mean you’ll lose some important functionality. Drip programs, social media analytics, content management, and SEO all require separate add-ons (LeadOutcome integrates with most web services through flexible APIs). These seven systems are by no means the only viable HubSpot alternatives. 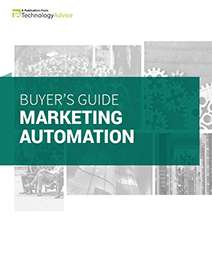 There are hundreds of MA solutions on the market, ranging from basic email tools to full-scale automation and CRM. To view a list of options tailored to your needs, visit our marketing automation product selection tool, or give us a call.